ArmorClad is our line of highest grade complete epoxy floor kits. 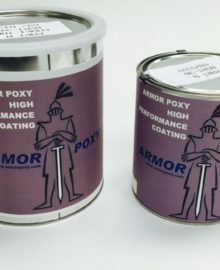 Using our unique 100% solids Adaptive Molecular Technology, which makes ArmorClad bond better than any other epoxy, ArmorClad can be applied to virtually any properly-prepared surface with superb results. Great for garages, but can also be used in kitchens, basements, work spaces, factories… just about anywhere. ArmorClad comes in two versions, with and without the special protective topcoat. We recommend that the topcoat version gets used to protect the decorative chips (no decorative chips are as durable as epoxy, even though ArmorClad uses epoxy chips) and should also be used if you live in an area where winter road salts and chemicals may come in contact with your floor. Add on kit for 3+ car garages or larger spaces. Kit contains 1.5 gals 100% solids epoxy, 1 qt ArmorEtch, 3 lbs decorative flecks. Covers up to 300 sq ft. Kits come complete with everything you need. Call us for large project-type jobs for special pricing.